If there was anyone that truly needed a strong second half, it was Jairo Beras. Signed three seasons ago for a reported $4.5 million bonus, Beras has been slow to put things together. He missed a year due to a suspension for falsifying his age. 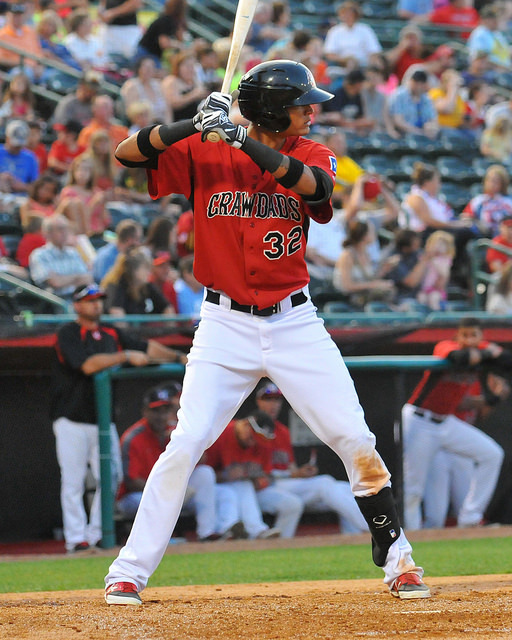 After 17 games in the Arizona Summer League in 2013, Beras came to Hickory for 2014 where he was overmatched in the first half (.201/.269/.251). Injuries to the Crawdads outfielders at the time likely staved off a mid-season demotion, as the Dominican native put together a big second half (.276/.336/.419) during which he hit 18 of his 25 extra-base hits. It was hoped that would be the springboard for a big 2015 season. However, the failure to run out a pop up on the second game of the season put him in the doghouse from the start. He played in one game from April 10 through May 8. A hamstring injury also hampered him and then another incident in June when Beras didn’t run out a play – with director of player development Mike Daly in attendance – brought things to a head. Soon after the second lack-of-hustle incident, I asked Daly about Beras’ development to which he responded that despite the Rangers were still excited about where Beras was in that development. My follow-up question wondered when Beras would be excited about his own development. Beras, 20, has since had a life-changing experience when he saw his daughter Angie come into the world. The new father – beaming with pride as he talks of her – seems to have new life in himself the past two months. In the second half, Beras has a slash of .308/.349/.467, with 22 extra-base hits in 61 games. The highlight included a 21-game hitting streak, the Crawdads second-highest streak. Numbers aside, Beras has shown the ability to grow as a player. Better pitch recognition and the ability to shoot pitches to right have cut his strikeouts from 29 in 93 at bats in the first half to 58 in 227 over the second half. That included just 15 over the length of the streak. But there is also urgency to his play. One example came on July 20 versus Augusta when he broke up a fledgling perfect game by Sam Coonrad by just beating out a chopper to the mound in the fifth. Last week in a game vs. Charleston, it was hustle into the right field corner to hold a hitter to a single. He’s shown quick hands on inside fastballs, but he is now better able to handle outside pitches by serving them to right, or lay off altogether. Beras still has some filling out to do with his 6-foot-6 frame that will help take many of the singles to night he is collecting now will become gap hits. I recently had an interview with Beras about his season. Through the translation of Edwin Garcia, here is that conversation. Jairo, first of all there’s been a lot of ups and downs this season. How have you felt about this season so far with everything? Beras: I feel a lot better. I feel like I’m making adjustments and working hard in the cage and I feel a lot better at the plate. You had a little girl this summer. Does having a daughter give you a better mentality about playing the game? Beras: I’m happy. Now I know that I’m not playing just for me, but I’m playing for my family. I always think about them. Take me through the first half of the year. I know you had some injuries and that you got in trouble for not running out some ground balls. What was the first half like for you? Beras: I felt a little bit lazy because I couldn’t go hard because I had a problem with my hamstring. After I came back from Arizona, I played a lot better because I can give one-hundred percent every time I go onto the field. That’s why I’m playing better now. You had the big second-half last year where you put some things together. Were you disappointed with how this year started? If so, how? Beras: No, I didn’t feel good when I’m up and down. Right now I feel really good. You came here last year after being out a year because of the suspension. How hard was it to get back into baseball shape and play every day? Beras: It wasn’t too hard because I was in the Dominican seeing a couple of pitches. I was always hitting and working out. But when I got here, it wasn’t easy because the pitchers command the pitches better. That’s why I had to make the adjustment. How hard was it to sit out the year? Beras: It was really hard not to play when I knew I could play. But I was always working so I could be ready to play when I came back. The second half, I could tell that you could see pitches better. What helped you especially to see breaking pitches better? Beras: I know that I have quick hands, so I am able to see the ball into the hands and take pitches. As far as the recent hitting streak, when did you start picking up that you had something special going 10 games, 15 games, etc? Beras: I didn’t know until someone told me. I didn’t even think about it. Beras: About a week before the streak ended. Someone from the Dominican called me. What’s the next thing in your development you have to work on? Beras: I want to keep working on my defense and play hard. When you get to the major league, what is that going to mean to you? Beras: I will feel so very happy and show everybody, who is Jairo Beras. Beras: I want them to know that I’m a really good player and that I’m a good person off the field, too. What do you know now about the game at 20-years-old that you wish you knew when you signed with the Rangers? Beras: The game is more mental that just about the physical. Before, I was just thinking just to play hard. Now I’m thinking about when I get into the box and about the hitting situation and that sort of stuff. When you are done with this season, what does a good year look like for you? Beras: The first thing I will say is thank you to God for keeping everybody safe. The second thing is that I really want to win a championship. I’m not too worried about numbers; I just want to help the team win the championship.